The analyst firm Analysys Mason has released a new Comptel Company Profile, recognising Comptel as one of world’s leading data processing vendors. The report also lists our DATA REFINERY software suite as a top-six mediation solution when ranked by worldwide marketshare. 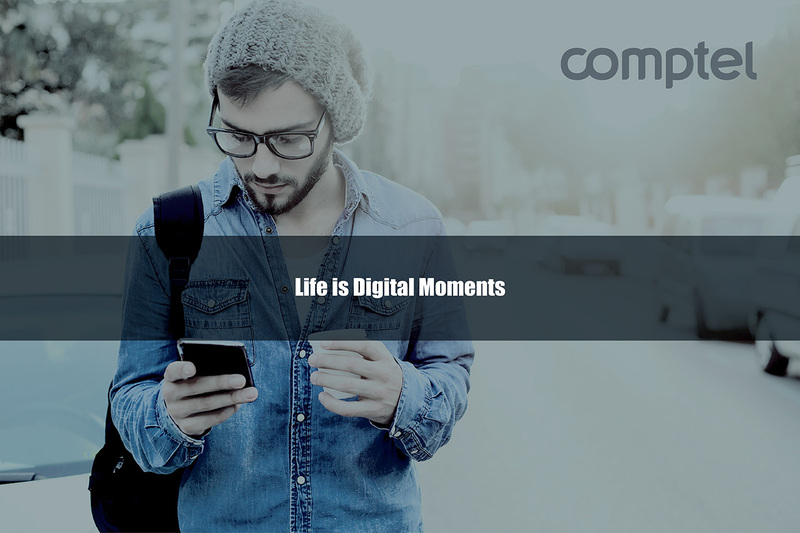 The report, titled “Comptel: digital transformation,” analyses Comptel’s overall product portfolio, 2015 financials and strategic direction. DATA REFINERY is based on Comptel’s award-winning EventLink technology, providing a software suite for convergent mediation, roaming management and enterprise data processing software products. It provides a comprehensive and productised data integration solution with over 1,000 off-the-shelf online, real-time and offline interfaces. Across the world, 150 operators trust Comptel’s data processing to turn massive amounts of raw data into valuable, purpose-driven, real-time actions. Operators of all sizes and volumes rely on DATA REFINERY, including India’s Bharti Airtel, Indonesia’s Indosat, Argentina’s Telefonica, Saudi Arabia’s Mobily, Denmark’s TDC and The Netherlands’ Ziggo. In all, Comptel processes more than 20 percent of the world’s mobile usage data through our software solutions. DATA REFINERY plays an important role in supporting the Digital Customer Journey, which is all about applying better technologies and data-driven business strategies and models to improve the way telcos engage and serve their customers in a personalised and contextual way. Within that journey, DATA REFINERY provides a layer of intelligent fast data to enable real-time decisions and actions. The software has the capacity to capture and process vast amounts of raw data in-stream. As a totally vendor, technology, and service agnostic solution, DATA REFINERY captures data of any type and from any source, including social media, apps, connected devices, networks, locational data and services. It then refines that data with important contextual information and sends it on to the next stage of its journey – all in real time. As a result, DATA REFINERY allows telcos to build a 360° profile of their customers based on diverse data sources. That profile is then available for other business systems, allowing telcos to craft intelligent, individualised service offerings, customer programs and more. Additionally, DATA REFINERY hides all technical complexity between the network and OSS/BSS layers through a unifying processing layer. To provide a perfect, personalised Digital Customer Journey, DATA REFINERY’s intelligent data fabric works seamlessly with two other pillars of that journey: FASTERMIND™ for customer engagement automation and MONETIZER™ for agile service monetisation. All three software suites rely on the same EventLink technology platform, benefiting from common capabilities such as a broad online and offline interface library, programmed and automated fast data processing, operational intelligence, business and operations reporting and a Software Development Kit (SDK). Together, the solutions within the Digital Customer Journey help telcos take advantage of a rapidly changing landscape, one in which the customer is in control. Our solutions allow telcos to compete and win on the basis of customer engagement, with personalised and contextually relevant content, offers and services. We’re proud to be recognised by Analysys Mason alongside other top players in the mediation market. 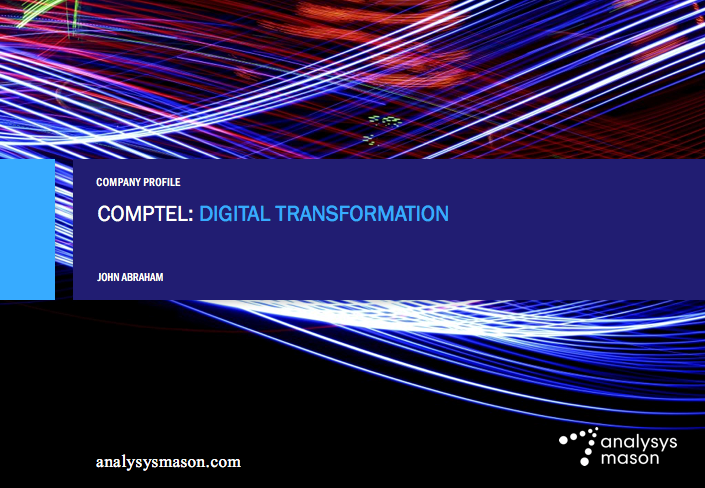 To learn more, download “Comptel: digital transformation,” a company profile from Analysys Mason. Here’s an existential question: if you don’t think or talk about the Internet of Things (IoT), do you even exist? With the increasing number of IoT use cases on display at telco events, that could soon be the reality. It’s no surprise to hear that, according to the findings from the Mobile World Live Annual Industry Survey, IoT is the most attractive new business area for businesses in 2017. IoT, together with 5G, NFV/SDN, artificial intelligence, analytics, and automation, was among the most frequently discussed, debated and showcased topics at this year’s Mobile World Congress. Discussions at MWC17 focused not on IoT theory, but rather the practical development of IoT applications and solutions, along with tangible real-life use cases. IoT solutions are expected to make life easier, healthier and smarter, and help to conserve the scarcest resource in an individual’s life: time. The solutions keep cities cleaner, safer and more secure. 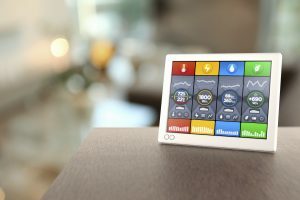 Tens of billions of sensors and connected devices will allow the digital economy to impact every aspect of our lives and improve the quality of life. A number of these use cases were on showcase at MWC17, ranging from health services to IoT-enabled camera drones, location services to smart lighting, fitness to augmented reality/virtual reality (AR/VR), smart factories to connected dogs, and autonomous cars to self-service retail stores, to mention a few. Never before MWC had exhibited so much IoT, with leading Tier-1 operators demoing a range of practical solutions including a theft prevention solution for cars, mopeds and bikes, smart rubbish collection, livestock tracking, remote city lighting control, and remote health monitoring. The conversation also revolved around the IoT network, including looks at LoRa, Sigfox, NB-IoT, LTE-M and 5G. 5G was heavily discussed throughout MWC17, in particularly in relation to certain IoT use cases like driverless cars, robo-taxis and remote surgical operations that mandate ultra-low ’millisecond’ latency, vast amounts of data, and frictionless, stable and high bandwidth data speeds. For example, Renault-Nissan has set a goal to roll out 10 car models with autonomous driver functionality by 2020. At the same time, LoRa Alliances and Sigfox are both rapidly expanding globally: LoRa, with its 400+ strong member alliance, has 34 publicly announced operators and Sigfox is already available in over 30 countries. Discussions around advanced sensor technology noted the remarkable size and duration of the batteries that power these devices. 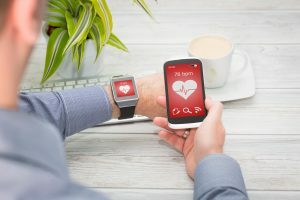 IoT-enabled sensors are extremely small, but their batteries can last for up to 10 years, enabling the long-term monitoring of movement, location, temperature, skin moisture, activity, blood pressure, heart beat and many more factors. We also learned about a new material called Graphene – invented in 2004 and later the subject of a Nobel prize in physics – that enables the development of entirely new active sensors that could even be installed inside the human body. Far away are times when MWC was just a showcase for telecom technology. Other industries presence has become a norm, the IoT is enabling the creation of intelligent and connected systems that will mean the entry of more new players, startups and industries at MWC. Car manufacturers, financial service providers, media companies, medical companies, smart city operators, transportation companies, retailers, industrial companies, agricultural entities and many more are involved or starting to get involved as they try to get their hands on with the latest transformative IoT solution. At the same time, operators certainly need to talking to those businesses to seek new avenues of revenue growth. By enabling digital services for IoT, telcos can dramatically expand their number of potential customers enjoying digital services. In time, operators will see, meet and cooperate with many more of these use-case driven players in events like MWC. Thanks to all those who paid a visit to our booth – it was well-visited, meeting rooms were fully-booked and we had a busy few days showcasing our solutions to customers, partners, analysts and media. In his keynote, AT&T CEO John Stankey said that the voice of today’s telco customer carries more weight than it has in the history of the telco industry. Customers want appreciation, personalisation and simplicity. They want to live their life on their terms and to get more for less. CSPs need to get comfortable feeling uncomfortable to live up to the expectations of today’s customers, said Stankey. To succeed, telcos must build engaging digital platforms. What matters the most is how many hours your customers spend on your platform and how much of your full range of personalised services and content they enjoy, he added. Most importantly, the product is software that captures the customer’s imagination. Vertically integrated products do not have a future any more, said Stankey. Instead, it’s all about software that goes beyond ubiquitous connectivity, contributing to greater customer experience and a stronger emotional bond to content. Software is the product wrapper that reengineers entertainment and glues everything together. With strong positions in music, entertainment and gaming, Vivendi has a unique perspective on the various types of digital content today’s mobile consumer craves. In his keynote, CEO Arnaud de Puyfontaine explained that telcos will be able to offer mobile content through partnerships with companies like Vivendi. The company’s mobile short studio, called Studio+, produces 10 episodes of a series, with each episode at 10-minutes in length, a model that de Puyfontaine said is perfect for bite-size mobile content experiences. His company is now developing telco partnerships to roll out the content, which in turns helps CSPs dip their toes into an innovative digital service channel. Vivendi tried to purchase its own telco subsidiaries in the early 2000s, he explained, but that failed strategy pointed the company toward a more flexible horizontal convergence model. Strategically, telco partnerships will provide Vivendi and its partners scale and agility, said de Puyfontaine. Executives from three mobile leaders – Sprint, Deutsche Telekom and Nokia – discussed the importance of edge computing to serving the new mobile economy. The panel included Günther Ottendorfer, COO, Technology at Sprint, Bruno Jacobfeuerborn, CTO at Deutsche Telekom and Michael Clever, SVP Mobile Broadband at Nokia. Edge computing brings network functions physically closer to the consumer to, among other things, dramatically reduce network latency. A number of factors drive this trend, including the growing number of connected devices (from VR/AR to connected cars) that require continuous broadband connectivity, and the emergence of 5G. For example, Sprint is diversifying its core network by deploying thousands of small cells instead of microcell towers, according to Ottendorfer. Meanwhile, Deutsche Telekom has joined the Telecom Infra Project, a community initiative to re-imagine how telco networks support data-intensive services like video and virtual reality. According to Jacobfeuerborn, video will account for 80 percent of the world’s mobile data traffic by 2021, which means telcos need to work now to bring better connectivity closer to the consumer. Nokia’s Clever spoke to the benefits of new network technologies – including a shared data layer and a stateless machine architecture – to introduce endless capacity, scale and robustness to the network. Real-time analytics of network data could radically reduce the complexity and costs of the network and help telcos generate new revenue streams by better leveraging network assets and customer data, Clever said. 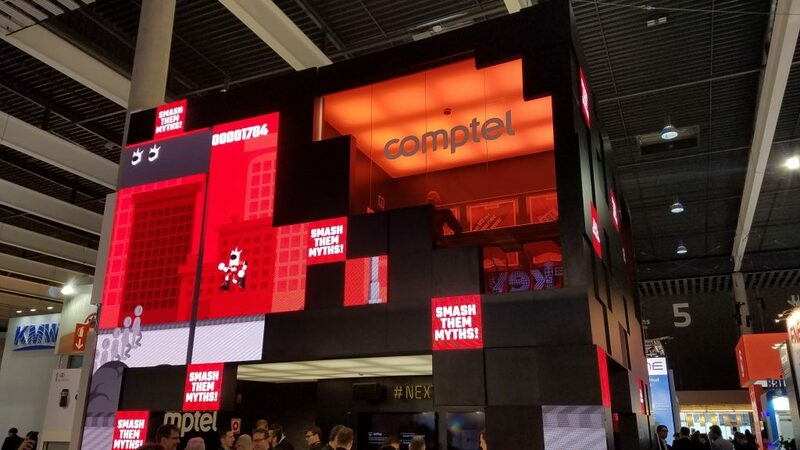 Did you miss Comptel at Mobile World Congress 2017? 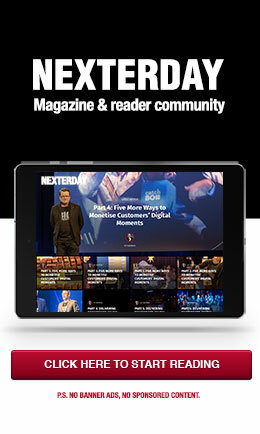 Catch up on what you missed by downloading our new research report, The Power of Personal, and keeping an eye on Nexterday.org for fresh content from our new book, Nexterday: Volume III.